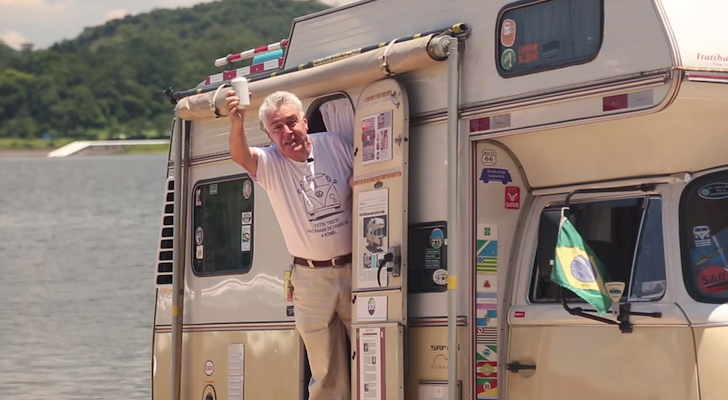 About the size of a lunchbox, this compact plug-in oven can heat up leftovers and cook raw food for healthful, simple meals on the road. Being able to cook a hot meal while on the road is such a comforting way to end or begin the day. 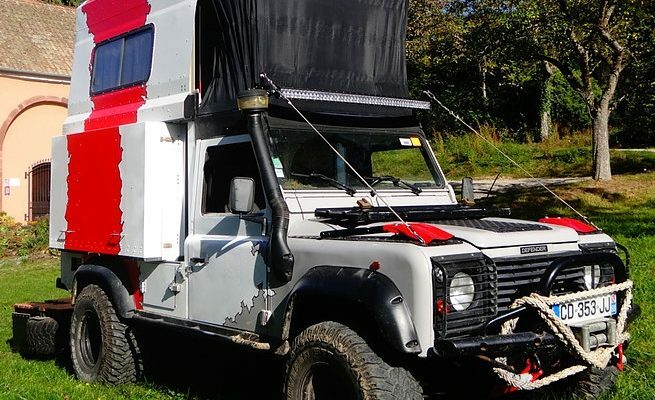 So what if that hot meal is already waiting for you when you pull up into a campsite or even when you wake up from that mid-afternoon nap? 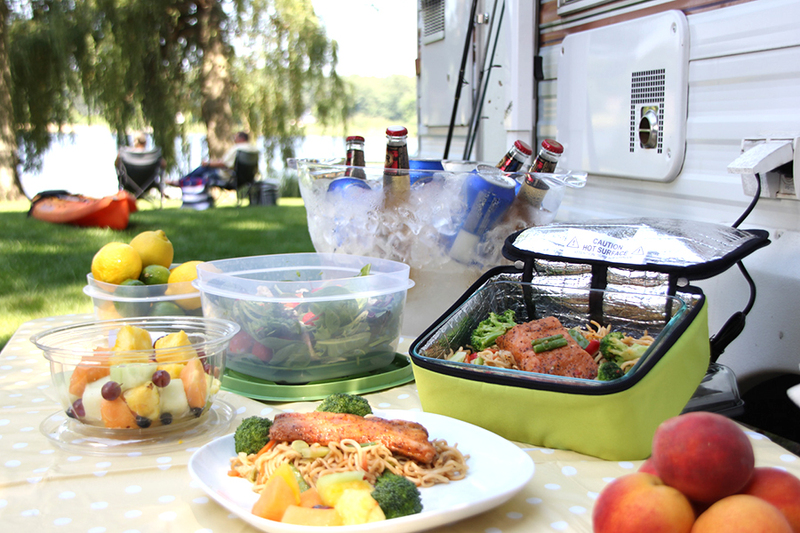 The Hot Logic electric lunchbox makes a great, simple portable oven for RVs. Originally designed for office or on-site workers who don’t want to resort to fast food or microwave meals, the Hot Logic brand of products use a patented smart cooking technology found in commercial ovens and professional kitchens. 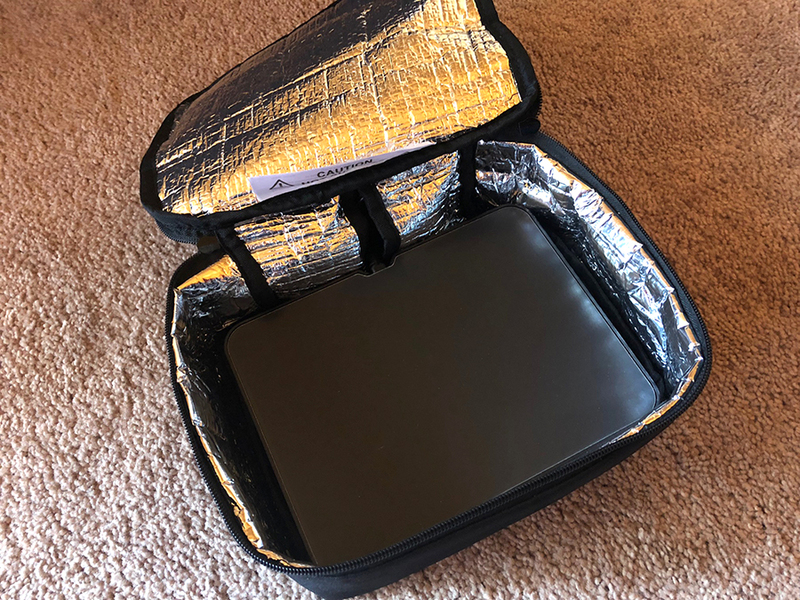 It’s essentially an insulated case with a heating element in the bottom that slowly heats up leftovers, TV dinners, and even fresh meat and vegetables. The oven is fully automatic, self-regulating, and doesn’t overcook food. The Hot Logic can either heat up leftovers or cook raw food. This portable slow cooker comes in two sizes. 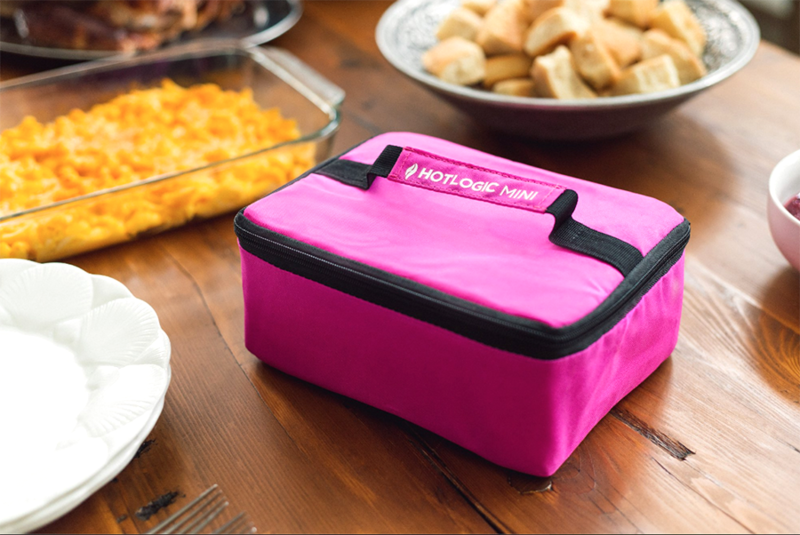 The Hot Logic Family Size fits a 9×13 pan or two 6-cup Pyrex containers and can be used for heating up food for a group or for special events like tailgating parties. 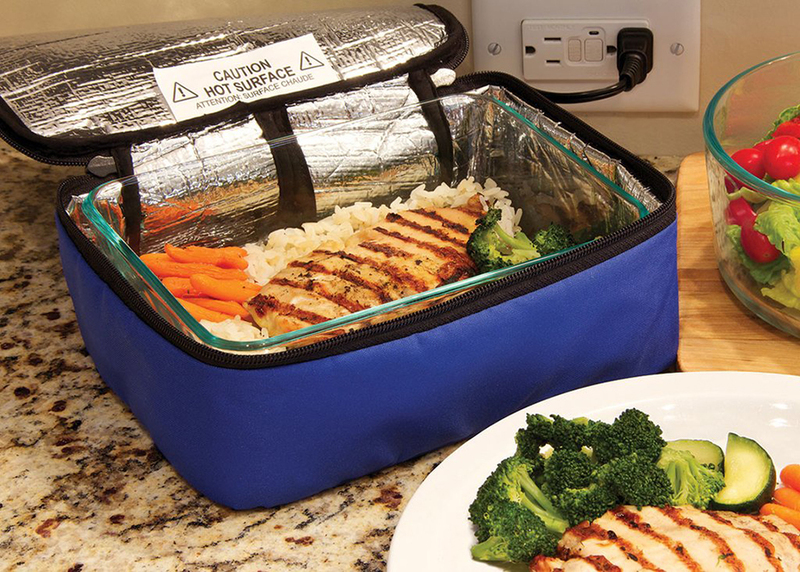 The Hot Logic Mini fits one 6-cup Pyrex dish and can also fit typical frozen meal containers. 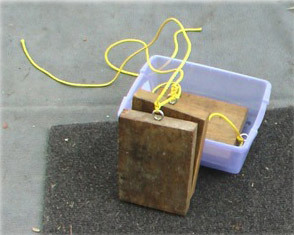 Unlike a microwave, foil, plastic, and cardboard can be placed in the Hot Logic. It is sometimes best to have a dish that can vent. Each of the little ovens have carrying handles and come in several exterior case colors such as black, orange, blue, and pink. 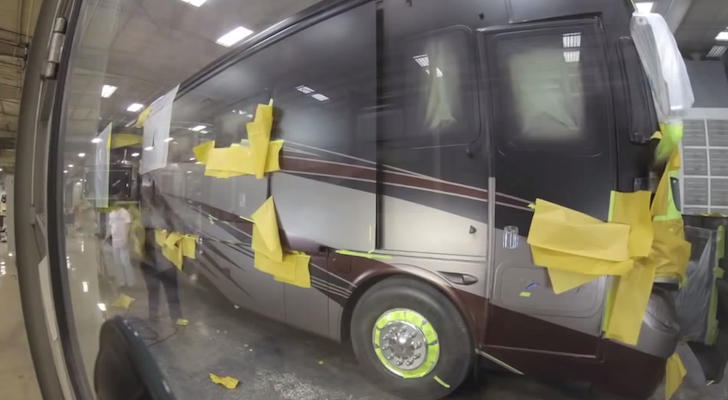 They also take up very little room in a cramped RV cupboard. The ovens come in a variety of colors and the plug tucks into a pocket in the back of the case. The ovens can cook up a frozen meal in about two hours and fresh vegetables take about an hour. The Hot Logic Mini is designed to hold the food at a serving temperature of around 165 degrees F for several hours without burning it. So you can plug it in in the morning and have a hot lunch around noon. The case surrounding the oven unit will get warm when in use, but the Hot Logic is safe to place on top of counters or tables. The Hot Logic Mini is sold with either a 110 plug or a 12-volt plug. 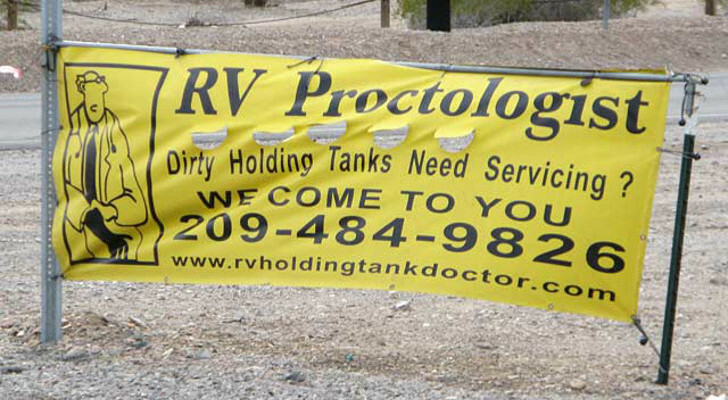 Speaking of plugging in. The Hot Logic can be purchased with two different plugs: the standard 110 volt two prong plug or a 12-volt plug for use in vehicles. The standard plug also works with a cigarette lighter inverter. There are no buttons to push on the Hot Logic ovens. All you need to do is plug it in and wait for the food to heat up. 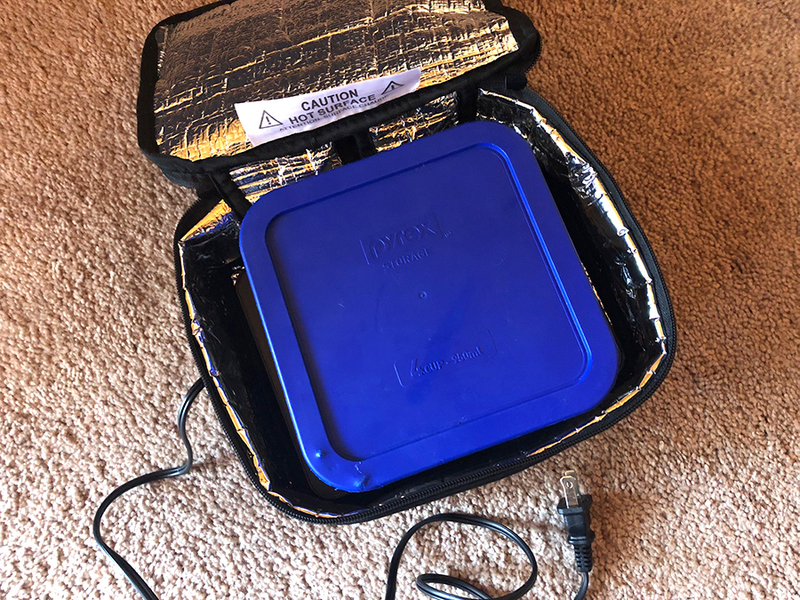 Because of its small heating element and slow-cooking capabilities, the Hot Logic uses only 45 watts (.5 amps) so it won’t drain your off-grid battery power. 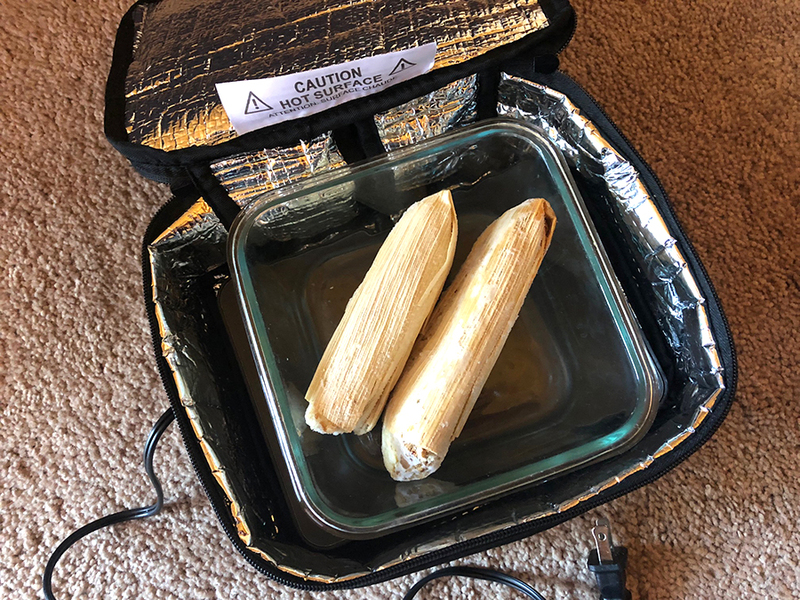 The case holds a flat heating element that keeps food at 165 degrees F.
Frozen tamales were heated in just over two hours. 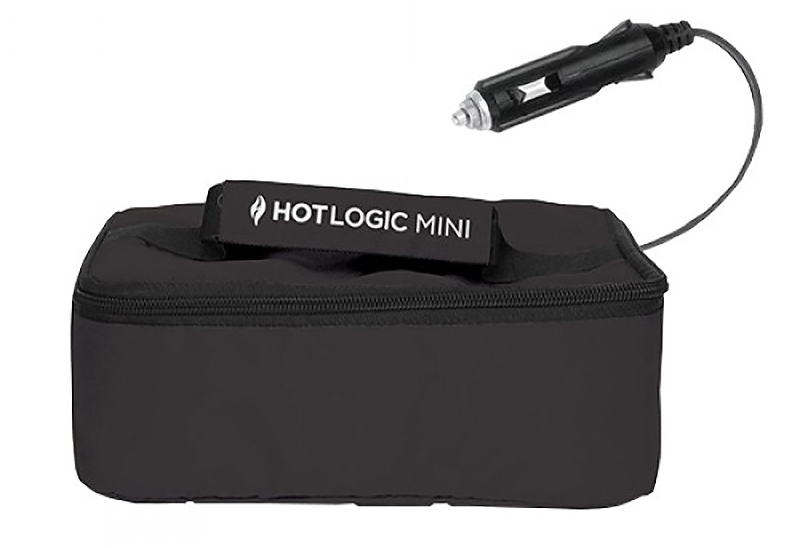 I recently purchased a Hot Logic Mini to use while camping in the teardrop trailer and for hot lunches while on the go. 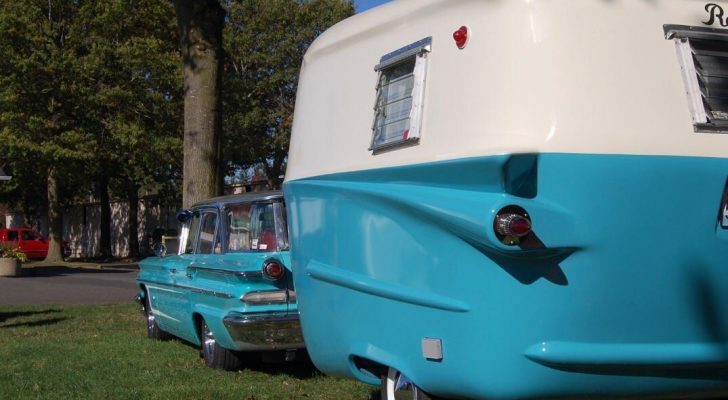 I chose the standard plug since we sometimes connect to shore power or I can use a 12-volt plug inverter for those times when we are off-grid. 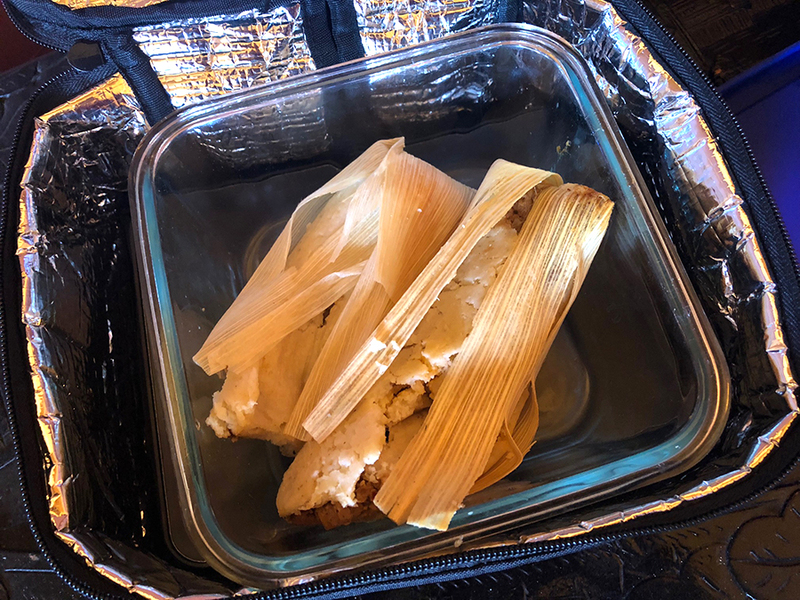 For an experiment, I placed two frozen store-bought tamales in a Pyrex dish and in two hours they were defrosted and warm. Another half an hour in the oven and a few scoops of salsa will make a full lunch. Some recipes may take some experimentation to find the correct time they need to stay in the Hot Logic. 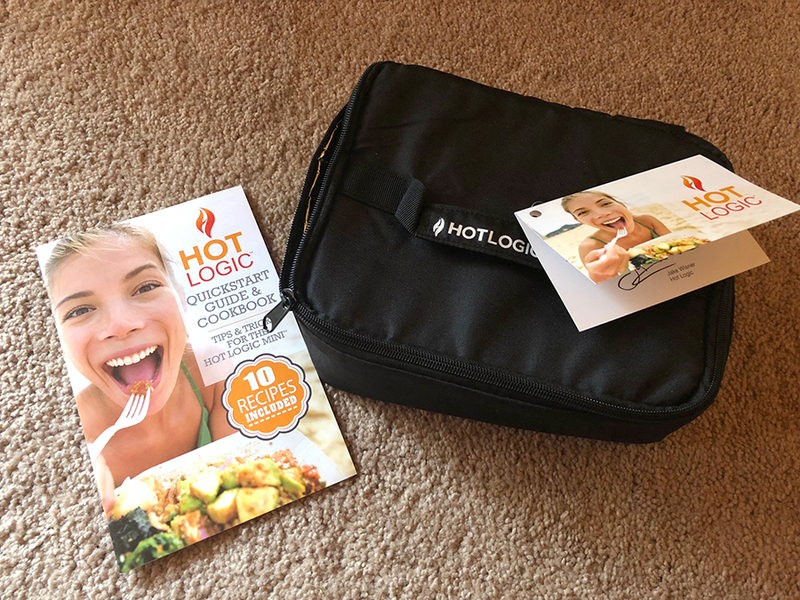 Each portable oven comes with a small recipe book and the Hot Logic Facebook page has a group where customers share their successful recipes. One of the more popular options seems to be the overnight or day-long recipes. Put the recipe together the night before, plug in the oven, and in the morning you have a hot meal. Or prepare your meal before taking off on a day trip. 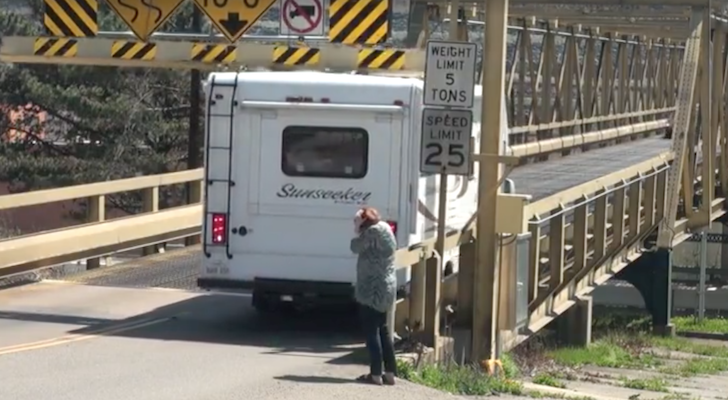 Now that’s a vacation! Whisk three to four eggs with salt and pepper directly into a Pyrex dish. Add one small chopped up tomato and one small red or orange bell pepper. Toss the vegetables into the eggs, put the lid on the Pyrex dish, and place into the oven. Plug it in, and in about 6 to 8 hours the eggs will be cooked in time for breakfast. Brown up a package of ground beef in a frying pan and set aside. 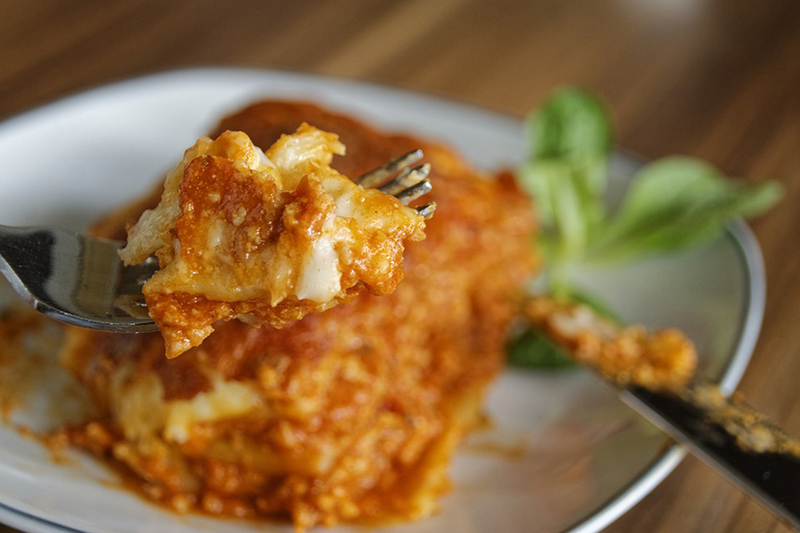 Spread a few tablespoons of tomato sauce into the bottom of a Pyrex dish and layer on top a few no-cook lasagna noodles. Spread a few tablespoons of ricotta cheese and shredded mozzarella on top of the noodles. Add some of the ground beef and some chopped raw garlic on top of the cheese and top with more sauce. Repeat the noodles, cheese, beef, garlic and sauce layers a few more times until the pan is filled nearly to the top. Cover the Pyrex dish with the lid and place into the Hot Logic. Leave for about 6 to 8 hours. The noodles should be tender when you cut into the lasagna. Place a pork loin in a Pyrex dish and sprinkle with salt, pepper, garlic powder, and one chopped raw onion. Pour a can of Coke over the pork loin, cover, and place dish into the Hot Logic. Plug it in and in about 4 to 6 hours the pork loin should be cooked and tender. Shred the pork with a fork and add your favorite barbecue sauce.